You are the inspiration for this card. I was watching one of your videos about different ways to use Spellbinder Dies and I had the dies that you used so I wanted to give it a try and the card came out great. What a beautiful card this is and not just because you credit me with the inspiration. 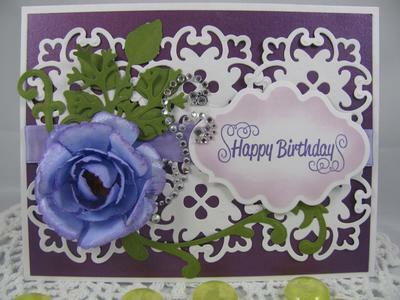 But the colours and those Spellbinders make the most gorgeous decoration and can enhance all your card making projects. It looks lacey and delicate and that rose is perfect. Thank you so much for sharing your creation. So if you are new to this way of creating cards then start with Starting your Spellbinder Collection and work your way through the rest ... you won't be disappointed. So lovely card! I love it! You make a good mix of colors and your rose is so beautiful!!! @ Rosie, thanks for stopping by and you nice comment on my card. I'll have more posted soon.